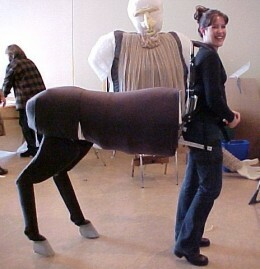 A centaur costume is an ambitious project, but with a very high impact result. I have collected a wide range of examples as inspiration for those who might want to tackle this project. They appear at a range of events from Halloween parties to stage plays. Most are original creations although some are based on centaur from Harry Potter, Narnia or Fantasia. If you know of any more commercially made costumes of this type, please let me know! 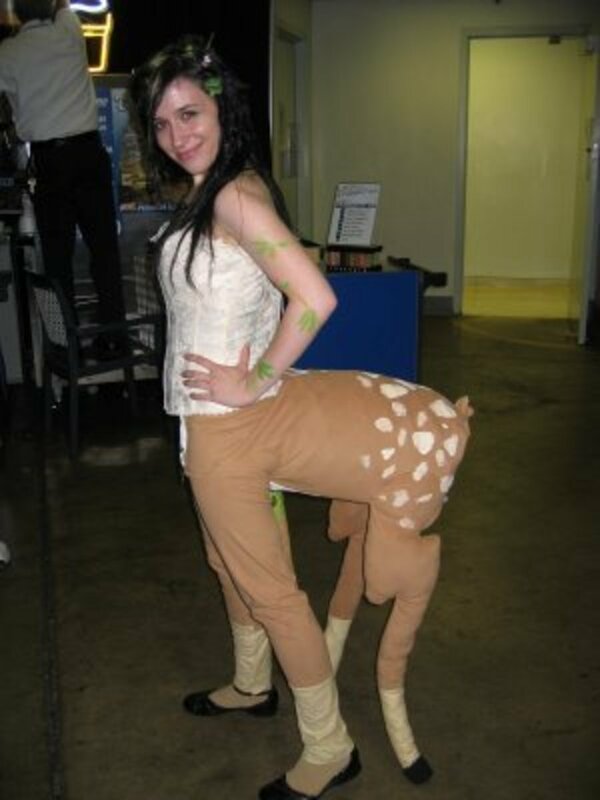 Also if you know of any hand or custom-made centaur costumes that I have not listed. 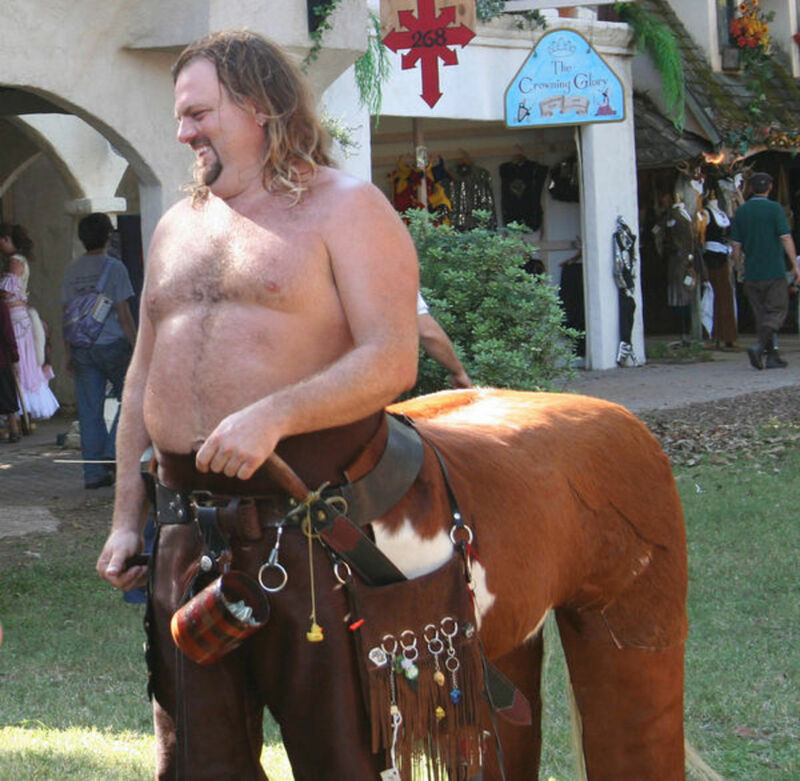 The guy shown above has what is probably the most famous centaur costume made by a Renaissance fair regular. This is a full body, static costume with rear wheels. For the child's design shown right (source unknown) the wheels are a bit less subtle but probably more effective. Halloween [adult, male](2010)--The back legs are a bit basic, but extra points for the pointed ears. Dustin Overby [adult, male] (2011)--a novel design with detachable rear end, shown with rider. Centaur with built in cooler! (2011)--This is cool. Girl's costume [child, female] (unknown)--Creative use of papier mache, with shots showing the costume in production. Without wheels on the rear portion, if it is a full sized replica, the centaur ends up pretty much fixed in place. Some of these examples may actually have wheels but if I wasn't sure I listed them as fixed. Model: Ingeborg Svarc Lauterstein design by Robert Rauschenberg [adult, female] (1948)--A great vintage example, see also here, and here. Contest winner [adult, male] (2007). Living statue centaur (2007)--shown setting up. Karl Lagerfeld Halloween Costume [adult, male] (2008)--A nice example of a over-shoulder detachable body. (Baby got back). See also here. "Greg" [adult, male] (2009)--Been there, done that, go the T-shirt.... See also here. 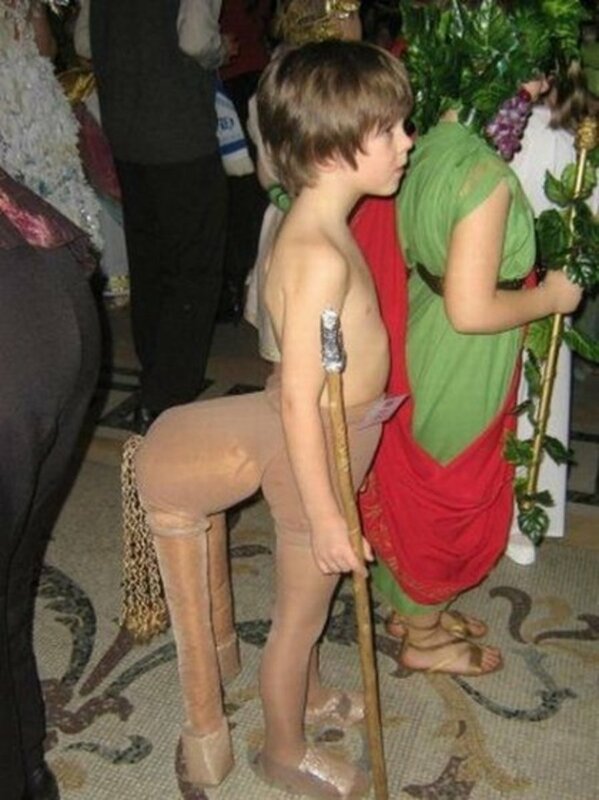 Baby Centaur [child, male] (Unknown)--This is the youngest centaur on the list. Cute! tarorae [adult, female] (2005)--With extensive floral accents. 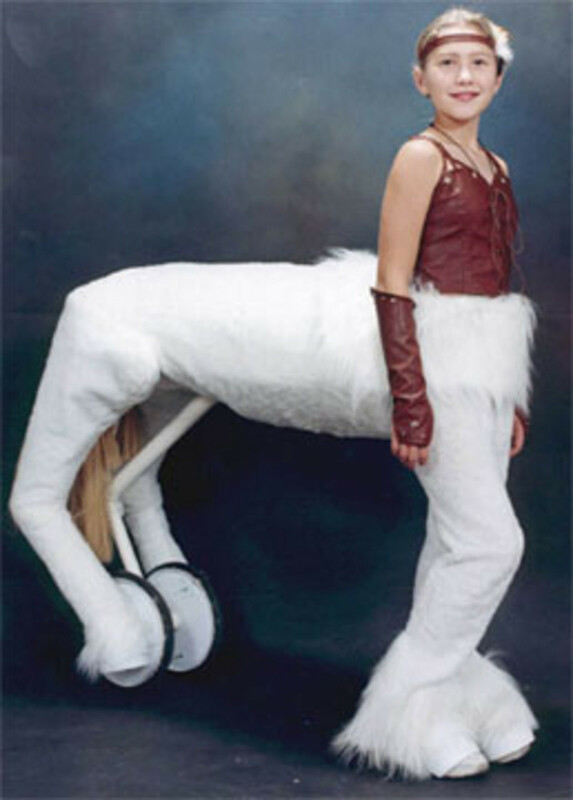 Halloween [adult, female] (2008)--unicorn centaur. FairieWorlds [child, female] (2009)--I love how the fur of the horse part matches the girl's hair. Zombie Party [child, female] --A papier mache version with no fur. See also here. 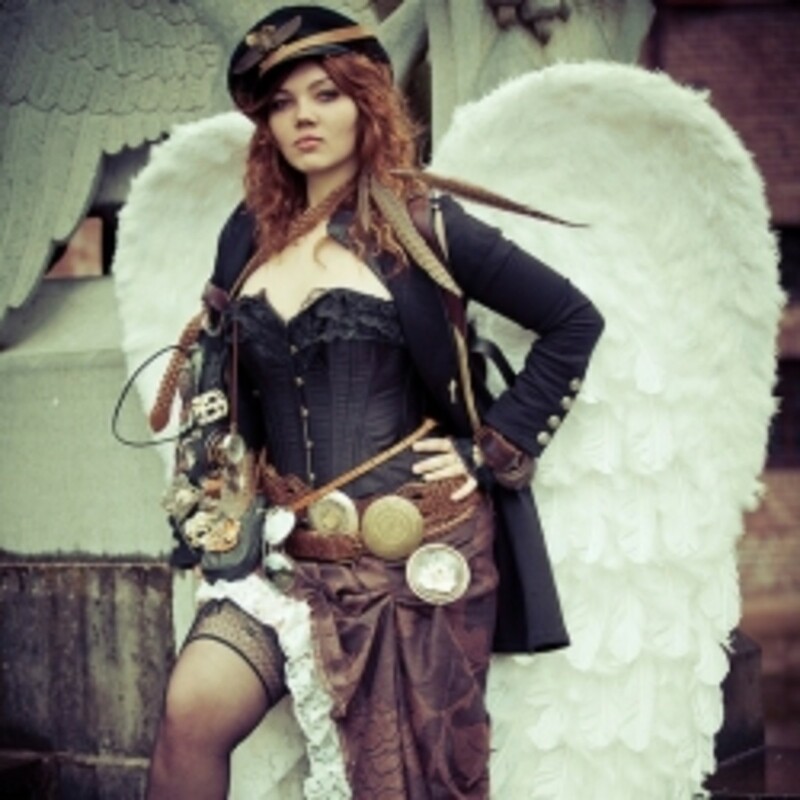 First Ave Halloween party [adult, female] (2009)--With wings? See also here. 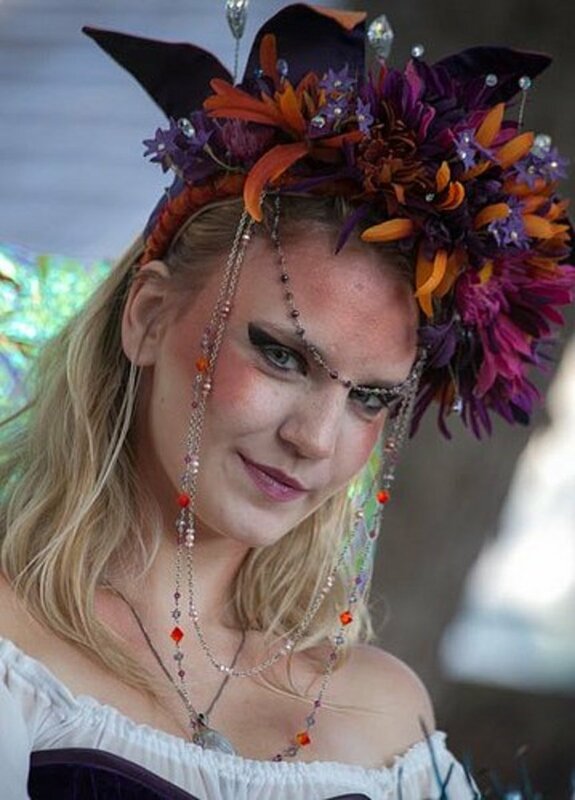 Ren Fair [adult, female] (2010). See also here, here and here. White centaur [child, female] (2010). Brunette [adult, female] (2010)--Another Harry Potter centaur? Medieval Fair [adult, female] (2011) See also here. Unknown--In a jaunty red color. This simpler, child-sized version was featured on Blame it on the Voices (2009). Original source unknown. Because the horse part of the body is drastically reduced in size it can easily be moved around without requiring wheels or moving parts. This design tends to work better with smaller people and children. Unless, of course, you take it to a comedic extreme. A pint-sized version of the sophisticated Fair unicorn costume can be seen here. Other similar designs can be seen here. Inflatable costume [male, adult] (2016)--Available from Wackyplanet if you are not the 'do it yourself' sort. Some variations on this costume have the rear legs a raised position so the do not even touch the ground. A relatively recent development is the availability of lightweight inflatable costumes. These are available on Amazon and include a unisex version that provides the horse part of the body, and one that includes an exaggerated male torso. One example (shown right) is from the Seattle Children's Theater premier production of Lion, Witch and the Wardrobe (2002). Male street performer [adult, male] (2008). 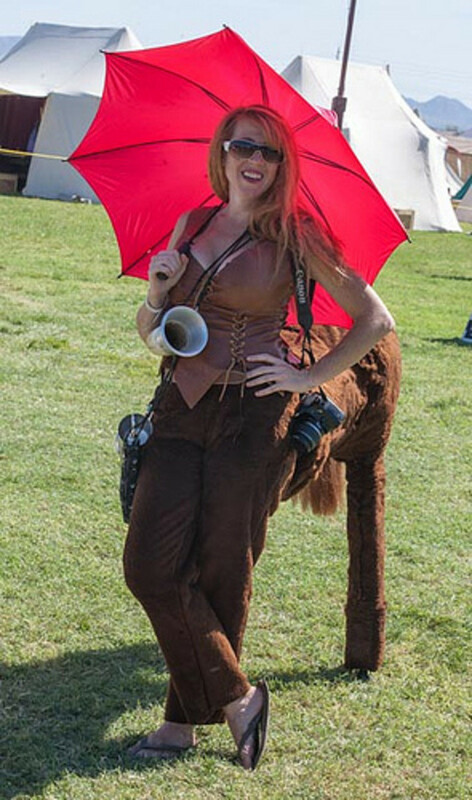 Ginny Di is working on a guide on how to created a Fantasia-style walking centaur costume (see below), but it does not seem to be available yet. There is also the traditional two person model for constructing a pantomime horse, which works just as well for a centaur design. This deer-taur costume (shown right) was spotted at BlizzCon in 2007. In general, costumes that include four legs and two arms are, regardless of the species represented, referred to as a "taursuit". These days there is also the option of becoming a centaur online in games such as the Sims. 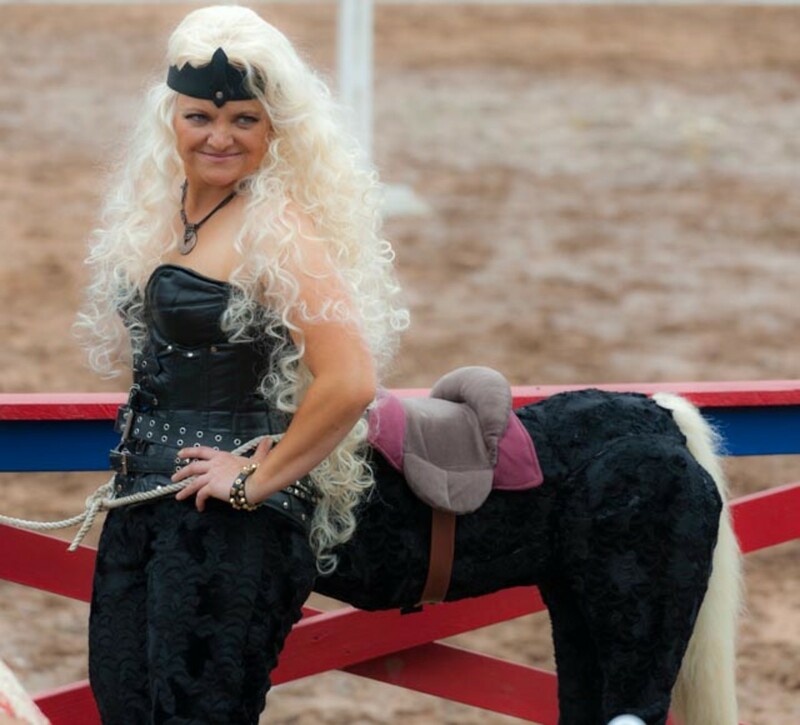 If you know of any centaur costumes not included in this list, please drop me a link! A 2014 commercial campaign for Nestle used a centaur that you might assume was created by computer-generated images but, as candid shots show (example), was actually a static costume. 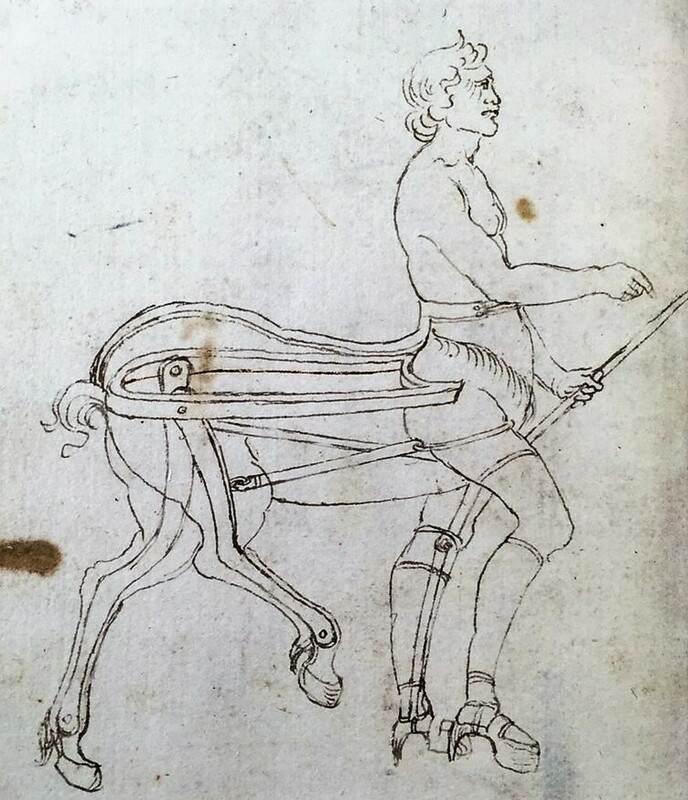 The basic structure of the moving centaur costume has a long history as antique sketch shown below demonstrates. That is a costume for the Seattle Children's Theater production of Lion, Witch and the Wardrobe (2002). Where did you happen to find this? The costume looks incredible, and I'd love to learn as much as I could about it and it's construction! Thanks!